This chapter describes a physiological and profound effect of amylin to inhibit meal-related glucagon secretion. Glucagon is processed from a large precursor, proglucagon, in a tissue-specific manner in pancreatic a-cells. In addition to amino acid nutrient stimuli, glucagon is also secreted in response to stressful stimuli, such as hypoglycemia and hypovolemia. Glucagon primarily acts on liver to initiate glycogenolysis and gluconeogenesis, resulting in a rapid increase in endogenous production of glucose. With longer stimulation, glucagon action at the liver results in a glucose-sparing activation of free fatty acid oxidation and production of ketones. Advances in Pharmacology, Volume 52 Copyright 2005, Elsevier Inc. All rights reserved. secretion, which mobilizes amino acid transporters and effects their storage in peripheral tissues. At the same time, insulin obligatorily recruits GLUT4 glucose transporters in muscle and fat. The hypoglycemic potential of such GLUT4 mobilization is averted only by the simultaneous liberation of endogenous glucose in response to feedforward (anticipatory) glucagon secretion. The effect of amylin and its agonists to inhibit amino acid-stimulated glucagon secretion is both potent (EC50 = 18 pM) and profound (^70% inhibition). This glucagonostatic action appears to be extrinsic to the pancreatic islet, occurring in intact animals and in patients, but not in isolated islets or isolated perfused pancreas preparations. On the other hand, the effect of hypoglycemia to stimulate glucagon secretion, which is intrinsic to the islet and occurs in isolated preparations, is not affected by amylin or its agonists. The physiological interpretation of these actions fits with the general concept, illustrated in Fig. 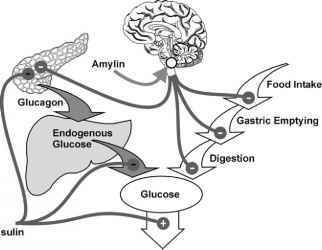 1, that amylin and insulin secreted in response to meals shut down endogenous production as a source of glucose, in favor of that derived from the meal. Amylin and insulin secreted in response to nutrients already absorbed act as a feedback switch for glucose sourcing. The insulinotropic (incretin) gut peptides, GLP-1 and GIP, secreted in response to yet-to-be-absorbed intraluminal nutrients, amplify b-cell secretion and thereby activate the glucose sourcing switch in a feedforward manner. FIGURE 1 Role of amylin, with insulin, in switching the glucose source after meals from endogenous production (dark arrows) to meal-derived sources (white arrows). This action of amylin is extrapancreatic (shown here as likely CNS-mediated). Hypoglycemia-stimulated glucagon secretion and nutrient (amino acid)-stimulated glucagon secretion are two clearly different processes, differently affected by amylin. The balance of glucose fluxes is disturbed in diabetic states, partly as a result of inappropriate glucagon secretion. Although glucose production due to glucagon secreted in response to hypoglycemia is normal or even reduced in diabetic patients, the secretion of glucagon (and production of endogenous glucose) in response to protein meals is typically exaggerated. Absence of appropriate b-cell suppression of a-cell secretion has been invoked as a mechanism that explains exaggerated glucagon responses, especially prevalent in patients with deficient b-cell secretion (type 1 diabetes and insulinopenic type 2 diabetes). A proposed benefit of insulin replacement therapy is the reduction of absolute or relative hyper-glucagonemia. 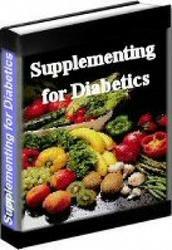 High glucagon is said to be necessary for ketosis in severe forms of diabetes. A further benefit of reversing hyperglucagonemia is reduction of the excessive endogenous glucose production that contributes to fasting and postprandial hyperglycemia in diabetes. The idea that amylin is a part of the b-cell drive that normally limits glucagon secretion after meals fits with the observation that glucagon secretion is exaggerated in amylin-deficient states (diabetes characterized by b-cell failure). This proposal is further supported by the observation that postprandial glucagon suppression is restored following amylin replacement therapy in such states. These observations argue for a therapeutic case for amylin replacement in patients in whom excess glucagon action contributes to fasting and postprandial hyperglycemia and ketosis. The selectivity of amylin's glucagonostatic effect (wherein it is restricted to meal-related glucagon secretion, while preserving glucagon secretion and glucagon action during hypoglycemia) may confer additional benefits; the patient population amenable to amylin replacement therapy is likely to also be receiving insulin replacement therapy, and is thereby susceptible to insulin-induced hypoglycemia. Most explorations of the biology of amylin have used the endogenous hormone in the cognate species (typically rat amylin in rat studies). Clinical studies have typically employed the amylinomimetic agent pramlintide. Studies of amylinomimetic effects on glucagon secretion include effects of rat amylin in anesthetized non-diabetic rats (Jodka et al., 2000; Parkes et al., 1999; Young et al., 1995), effects of rat amylin in isolated perfused rat pancreas (Silvestre et al., 1999), effects of pramlintide in anesthetized non-diabetic rats (Gedulin etal., 1997b,c,d, 1998), effects of pramlintide in patients with type1 diabetes (Fineman et al., 1997a,b,c,d, 1998a; Holst, 1997; Nyholm et al., 1996, 1997a,b,c; Orskov et al., 1999; Thompson and Kolterman, 1997), and effects in patients with type 2 diabetes (Fineman et al., 1998b). In addition, effects of amylin antagonists have been observed in isolated preparations (Silvestre et al., 1996), and effects of antagonists or neutralizing antibody have been determined in whole-animal preparations (Gedulin et al., 1997a,e,f). Insulin-dependent diabetes mellitus (IDDM) is characterized by relative or absolute hyperglucagonemia (Muller et al., 1970; Unger et al., 1970) and exaggerated glucagon secretion in response to amino acid (Raskin et al., 1976; Unger et al., 1970) or protein stimuli (Kawamori et al., 1985; Muller et al., 1970). Further, it appears that the presence of glucagon is essential in the pathogenesis of the full syndrome that results from complete insulin deficiency and that elevated glucagon concentrations complicate the course of the disease (Dobbs et al., 1975), contributing to marked endogenous hyperglycemia (Raskin and Unger, 1978) and hyperketonemia (Unger, 1978), which are present if insulin deficiency is associated with glucagon excess, but not if both glucagon and insulin are absent (Unger, 1985). Glucagon suppression could be a potentially useful adjunct to conventional antihyperglycemic treatment of diabetes (Unger, 1978). It is now well established that at least four key influences regulate the secretion of pancreatic islet hormones: plasma levels of vital nutrients such as glucose and amino acids, the autonomic nervous system, circulating hormones such as the incretins, and islet hormones themselves (Ashcroft and Ashcroft, 1992). Much work has established that b-cell secretion is promoted by glucagon, while the b-cell products insulin (Argoud et al., 1987) and amylin (Degano et al., 1993) reportedly reduce insulin secretion. Insulin partly inhibits pancreatic a-cell secretion of glucagon (Raskin et al., 1975), a so-called glucagonostatic effect. It has been proposed that the exaggerated glucagon secretion in IDDM may be attributable to the loss of a restraining influence of insulin on pancreatic a-cells (Samols et al., 1986; Unger and Foster, 1992). 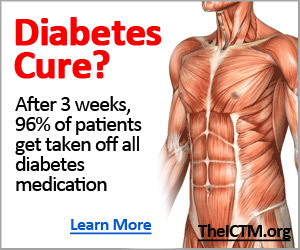 Because pancreatic a-cells remain sensitive to the restraining influence of insulin in IDDM patients (Raskin et al., 1978), the suppression of glucagon secretion has been proposed as one of the benefits of insulin therapy. In view of the possibility that, like other islet hormones, amylin might influence the secretion of the others, its effect on glucagon secretion was studied in vivo. In this work, (Gedulin et al., 1997g; Young et al., 1995), the effect of amylin on arginine-stimulated secretion of glucagon was examined in anesthetized rats. Because amylin administration can acutely change plasma glucose concentration in rats (Young et al., 1991) and can acutely inhibit insulin secretion (Degano et al., 1993), both of which can affect glucagon secretion, the influence of those potential confounders was standardized using the hyperinsulinemic euglycemic clamp technique (DeFronzo et al., 1979) during amylin infusion at different rates. Anesthetized male Sprague Dawley rats were cannulated via the femoral artery and vein for sampling and infusions, respectively, during a hyperinsu-linemic euglycemic clamp procedure (glucose 6 mM). Infusions of rat amylin (0, 3.6, 12, 36, or 120 pmol/kg/min) began 60 min before a 10 min infusion of 2 mmol L-arginine (delivered so as to avoid hypotensive stimulation of glucagon secretion; Lindsey et al., 1975). The data obtained are plotted in Fig. 2. Plasma glucose concentrations and insulin concentrations, which themselves can alter glucagon release (Maruyama et al., 1984), and mean arterial pressure did not differ between treatment groups for the 60 min following arginine infusion. L-arginine provoked a 160 pM increase in plasma glucagon concentration within 20 min of administration in the absence of infused amylin. Continuously infused amylin reduced integrated glucagon secretion by 47-67% at the three highest amylin infusion rates (P < 0.05-0.01). Steady-state plasma amylin concentrations obtained during and following different amylin infusion rates were calculable from other kinetic studies (Young et al., 1996), and could be derived from infusion rate using the expression [amylin] = 10(log infrate>x1.18+1.024, where [amylin] was measured in pM and infusion rate in pmol/kg/min. The plasma amylin concentrations thereby obtained were used to construct a concentration response that yielded an EC50 of 18 pM ± 0.28 log units for glucagon suppression, as shown in Fig. 3. This concentration was within the range of plasma amylin values reported to circulate in rats (Pieber et al., 1994), and indicated that glucagon suppression was likely a physiological effect of endogenous amylin in this species. It was postulated that amylin secreted from the b-cell-rich islet medulla into the local islet portal circulation might be carried to a-cells on its passage to the islet cortex, and act there directly to inhibit glucagon secretion. When the microanatomy of islets of Langerhans was considered (Redecker et al., 1992; Weir and Bonner-Weir, 1990), it was anticipated that amylin secreted into the local portal circulation would be of high concentration as it flowed to the a-cell-rich cortex (Bonner-Weir and Orci, 1982). For example, in a semiquantitative histochemical study, insulin concentrations within the islet were estimated to be 100-200 times higher than concentrations found in plasma (Bendayan, 1993). FIGURE 2 Dose dependence of effects of rat amylin on arginine-stimulated glucagon secretion in anesthetized rats. Data from Gedulin et al. (1997g) and Young et al. (1995).